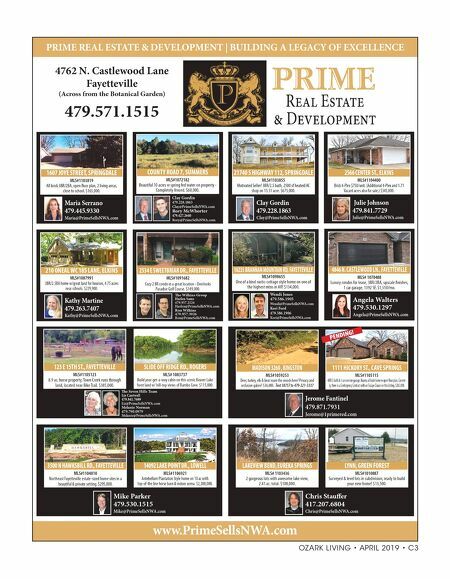 FOR MORE INFORMATION VISIT: riverwoodhomesnwa.com OR CALL: 479-316-7440 Linda Marquess 479-841-6216 Sam Niccum 479-524-1393 Bailey Tahy 479-236-7426 Taylor Marquess 479-601-7978 Jacki Hudak 479-530-7045 Tamara Rose 479-659-9325 Listed by Riverwood Homes Real Estate Southwinds CENTERTON, AR starting in the $ 170's Come reserve your lot now for a cottage or manor home! 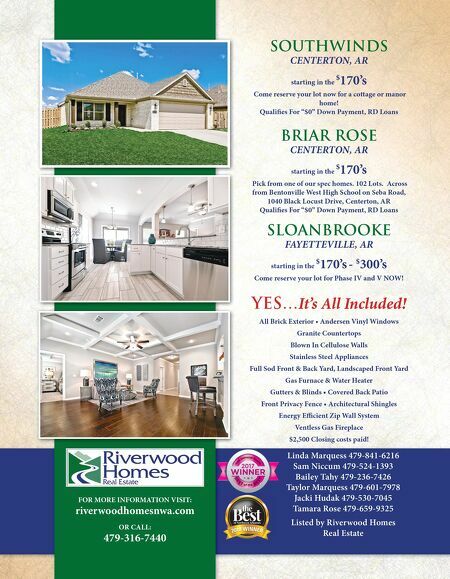 Qualifi es For "$0" Down Payment, RD Loans BRIAR ROSE CENTERTON, AR starting in the $ 170's Pick from one of our spec homes. 102 Lots. Across from Bentonville West High School on Seba Road, 1040 Black Locust Drive, Centerton, AR Qualifi es For "$0" Down Payment, RD Loans SLOANBROOKE FAYETTEVILLE, AR starting in the $ 170's - $ 300's Come reserve your lot for Phase IV and V NOW! YES…It's All Included! All Brick Exterior • Andersen Vinyl Windows Granite Countertops Blown In Cellulose Walls Stainless Steel Appliances Full Sod Front & Back Yard, Landscaped Front Yard Gas Furnace & Water Heater Gutters & Blinds • Covered Back Patio Front Privacy Fence • Architectural Shingles Energy Effi cient Zip Wall System Ventless Gas Fireplace $2,500 Closing costs paid!